Addicted to soda? Well, you can break that sugar habit once and for all! Because one of the nonpareil products at the 2012 natural foods expo west, being manufactured by SWEET LEAF liquid stevia is their new Sweet Drops Cola flavor. Oh yeah! This was a mighty taste. Just a few drops in a glass full of carbonated water and I was quenching my thirst with a certified cola tasting beverage that included – ahem – zero calories, zero carbs, and zero glycemic index. No more boring water offers 14 other exciting flavors like Apricot Nectar, Chocolate, Root Beer, Vanilla Cream, Grape, and Berry. Cola flavor is not on the market for sale yet. But dieters and diabetics will especially want to add this item to their cupboards as a natural alternative for a bit of guiltless, daily sweetness. You SHOULD be bitter about it! I’ve been downing this healthful tincture for years as the best cure for digestive upsets of all sorts. So it was a total treat to discover a home-grown company with a perfectly bright new idea. Gluten intolerant? Need to skip on dairy, soy and corn? I can’t live, if livin’ is without you! I met Arnel McAtee of ARNEL’S ORIGINALS in the wee hours of the morning filling her sample baskets with the truly delicious Organic Buckwheat Bread. We immediately shared our mood swing stories with food. After discovering that her own very young children were intolerant to all kinds of foods resulting in extreme reactions like eczema, by testing and removing certain food items (and consequently being yelled at, kicked and bit by her 3 year old who was in a sugar/carb craving frenzy and desperate for a piece of toast) she decided to create something they could all actually live with. Arnel is in the medical profession so formulating an organic healthful product was serious business all yummi-ness aside. I walked away with my signature package and will be attempting to bake for the first time in a year. Gulp. I looked up her video for moral support. Get to your local organic grocer and cook with Arnel. Le Taste. It’s so LE GRAND! Our Canadian friends have been busy turning everyday cooking into an out of the ordinary gourmet experience with cold-processed sauces created with pure and fresh ingredients. Out of body experience on a cracker was the only way I could call it as my tongue rolled around the tangy, pungent, aromatic sauce in my mouth. And for goodness sake, I’m Sicilian! I wouldn’t rave about tomato sauce if it was merely good. Do I need to say anymore? Except maybe Bon Appetite! Washing my clothes now for the COMMON GOOD. Safe, green, hardworking household products in bottles & bulk refill, this green company wants to make a safer and cleaner world by using less plastic, less packaging and harmful chemicals. Laundry detergent comes without fragrance but the lavender scent smells just picked from my balcony garden. 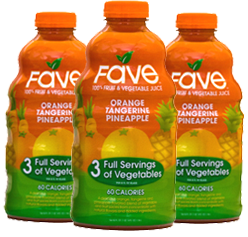 FAVE Orange Tangerine Pineapple 100% Fruit & Vegetable Juice. Who would have thought that drinking these together could be so delicious. Totally thirst quenching, Zero Fat and only sixty calories per serving. I seriously cannot get enough! Go to their website to get more info. I love the write-up about the Gluten Free Organic Buckwheat Bread, Gia. Great job. It was a pleasure meeting you and hope our paths cross again soon. Love all the valuable info!